Lion is a leading beverage and food company with a portfolio that includes many of Australia and New Zealand’s favourite brands. Under the category of beer, spirits and wine, Lion has: XXXX, Speight’s, Tooheys, Steinlager, Hahn, James Boag, Bacardi and Wither Hills. A significant brand in Lion’s suite of brands is Tooheys New. Born in 1931, Tooheys New was a ‘new’ style of beer – a draught lager brewed for full flavour when served icy cold – a refreshing alternative to the warm English ales that were common at the time. According to research by Nielsen in November 2011, Tooheys New is the fourth biggest beer brand in Australia. Despite the brand tracking incredibly well, however, it was evident that Tooheys New needed to improve the brand’s relevance among a new wave of beer consumers, and that there was a desire to reinforce its perceived popularity and raise its visibility. To change how consumers perceived and felt about Tooheys New, Momentum developed the Tooheys New Crew – a campaign that supported its brand driver of creating genuine connections with its consumers and would move the relationship with Tooheys New beyond habit. Lion is a brand building company, focused on growing its strongest brands and markets. It recognises the importance of clearly differentiating and developing its brands, to excite and engage its consumers and grow returns for its customers. From its consumer insights results, Lion found that Tooheys New consumers are outgoing men who love everything their great Aussie suburban lifestyle has to offer, but felt that Tooheys New wasn’t connecting them to what matters most in their lives, which are their mates, family and communities. Following these results, and in an overly competitive marketplace, Momentum was challenged to drive customer growth in Australia and to increase Tooheys New’s association with mateship, while preserving the Tooheys New adorer base. The Tooheys New Crew would set out to bring to life the Tooheys New brand campaign, ‘The Beer Economy’ (a mate does you a favour and you say thanks with a beer – analysed in a previous case study by Marketing and available online at marketingmag.com. au in our Case Study section), developed by Saatchi and Saatchi Australia in February 2010. 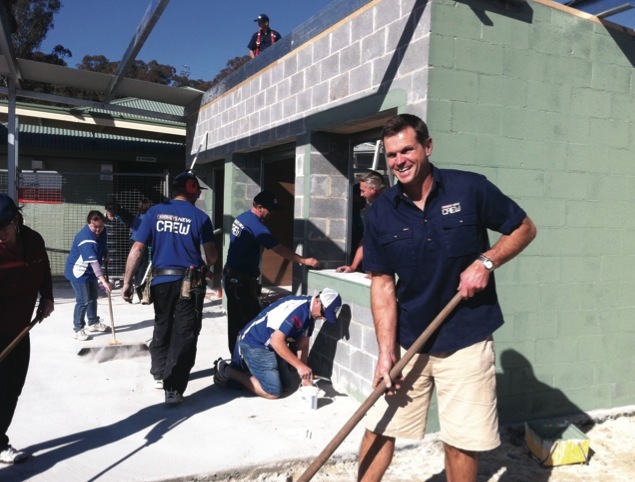 The Tooheys New Crew is a team of skilled tradies and good mates, headed by rugby league legend Paul ‘The Chief ‘ Harragon and supported by New South Wales Origin Legends, who are travelling all over New South Wales completing favours in the form of building projects, at no cost to the local community. A below the line communications campaign was implemented in the Crew’s inaugural year. Public relations and social media have been integral to the campaign, and used to drive engagement and awareness of the brand’s involvement across the projects and entire campaign. The campaign has generated huge community involvement at a local level from workplaces, local sports clubs, and social and community groups, as well as mass awareness through media relations pre, during and post projects. Social media was key to driving campaign awareness, with all project submissions driven online via the Tooheys New website and Facebook page – generating hundreds of submissions in its first year. Now, with the Tooheys New Crew in its second year, to leverage the influence of the newly created adorers, the team will deploy above the line marketing activities across a number of marketing connection touch points. The Tooheys New Crew campaign started in November 2010 as a oneyear campaign. Given its success, it was extended for a further year and has now been running for a total of 15 months. Residents in targeted towns nominate projects on the Tooheys New website or Facebook page, and then worthy projects are identified and announced. Over a 12-month period, 16 projects were completed, which equated to the Crew completing a project every two to three weeks. in local media, mainstream media opportunities are also considered throughout the year to generate positive coverage about the Crew, from sponsorship deals and appearances on The Footy Show, to a half-page spread in the sports section of The Daily Telegraph and a full-page story in in-flight magazine OUTthere. Tooheys New funds the projects, and brings the Tooheys New Crew to town. Local sales representatives further engage the local communities by hosting pub shouts before the project is complete. 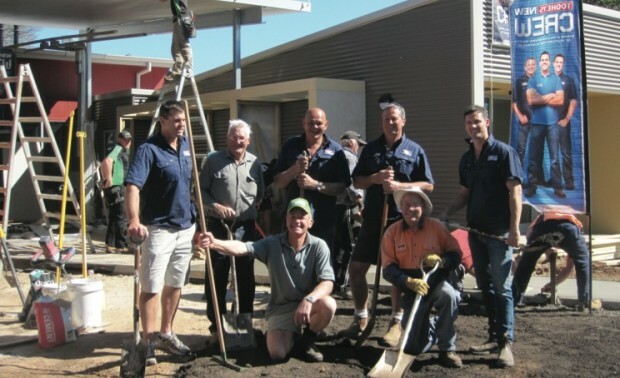 The pub shouts give the town the opportunity to share a Tooheys New with the Crew, Paul Harragon and other New South Wales Origin Legends, and for the Crew to invite them on-site to lend a hand and celebrate the project’s completion the following day. The Tooheys New Crew campaign in its first year went above and beyond its year one objectives and drove considerable engagement with local communities that have supported the brand for the last 80 years. The Crew completed 16 projects across New South Wales, which were valued at one million beers worth of favours, and over $1,660,000 worth in building projects. Thousands of positive online conversations referenced the great work of the Tooheys New Crew and the positive community spirit the Crew coming to town generates. The Tooheys New Facebook community has increased likes by 4553 since the Tooheys New Crew campaign was launched. The public relations campaign implemented by Momentum was extremely successful, generating more than 300 media articles and achieving over nine million in circulation. Overall, the Tooheys New Crew campaign has generated 15% campaign awareness to date, and over 50% of the ‘touched’ group feel more positive towards the brand because of the Tooheys New Crew. More than 2000 people have been engaged on a grassroots level directly and throughout on-site activities. Often more than 100 local volunteers turn up to help at each project, and the Crew shown a generosity of spirit reaching far further into communities than what was imagined. This inspired the huge groundswell of volunteers at projects and made a lasting impact on participants. As a result, millions of Australians view Tooheys New in a new light, seeing it as a brand that makes communities more sociable places.